Showing 1 - 2 of 2 Products for Off-Road Light. 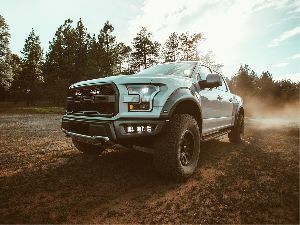 2017-2018 Ford Raptor A-Pillar Light Mount Kit allows you to mount two D-Series LED Lights (not included) at the base of your Raptors A-Pillars, adding visibility in any situation. This mount kit comes with everything you need to install 2 D-Series lights (not included) in the A-Pillar locations and is backed by Rigid Industries limited lifetime warranty. Fits 2 D-Series. 2017-2018 Ford Raptor Grille Light Kit features two 6" SR-Series LED Lights, a black powder coated steel grille, and gives your Raptor an aggressive new grille while adding the visibility and clarity that comes only with RIGID Industries lights. This light kit comes with everything you need to install 2 SR-Series lights in the grille light locations and is backed by Rigid Industries limited lifetime warranty. Fits 2 SR-Series.